While Brexit may have muddied the waters separating Japan and Britain, the design collaborations between the two island nations are still strong. Duncan Shotton, who hails from Wiltshire but has been based in Tokyo since 2012, creates everyday objects with amusing quirks. 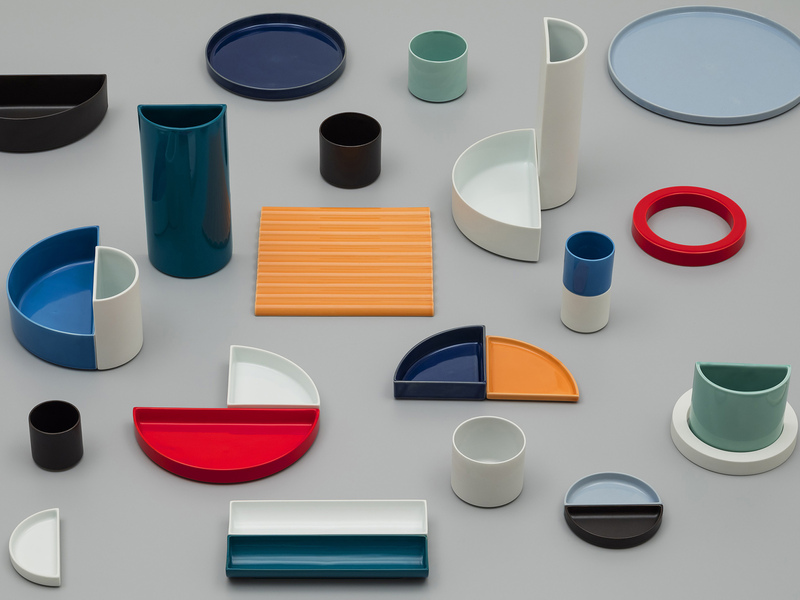 His designs often involve an element of visual play and are refreshingly colorful at a time of over-muted palette trends. You may have already seen his rainbow-shaving pencils at museum shops, and his Shoeperhero shoe horn has been featured in a previous On: Design. This time Shotton has turned his attention to pure white — but, of course, with a couple of twists. 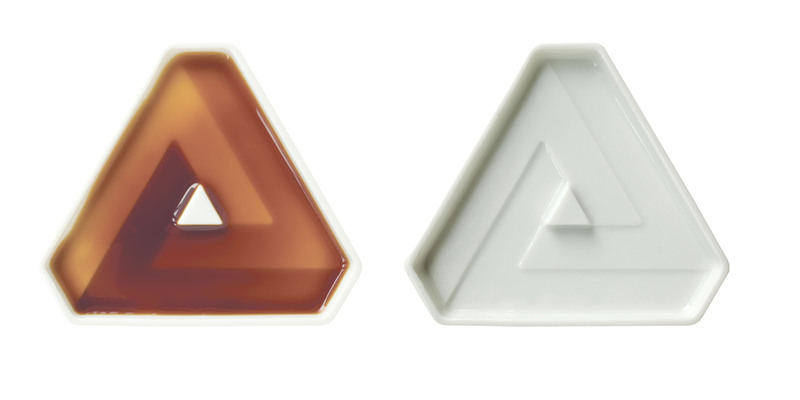 Soy Shape dipping dishes are made of hakuji white porcelain, but when filled with soy sauce, they reveal bold patterns of cubes or triangles. 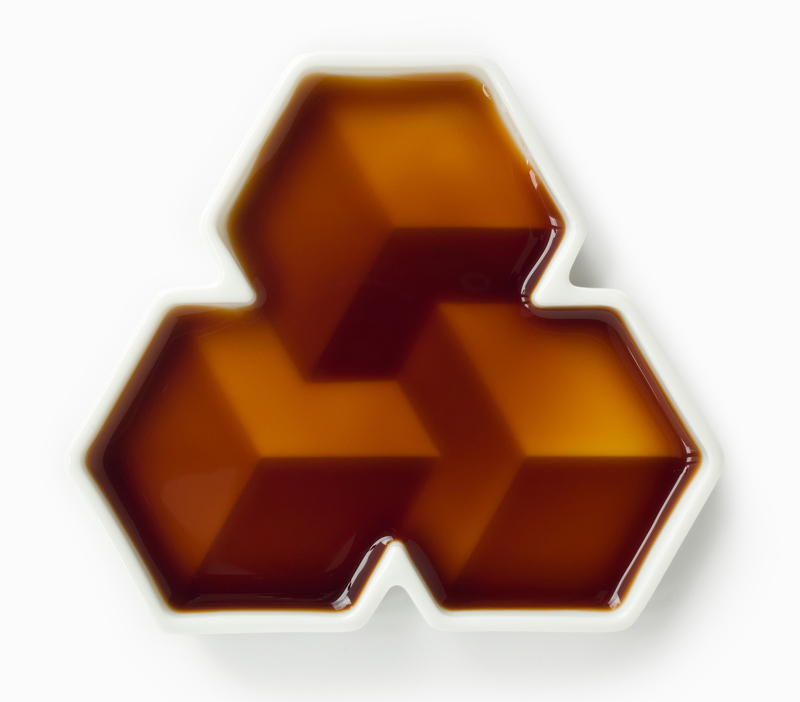 The varied depths of each dish create different tones in the dark soy sauce above it, giving the designs a 3-D effect. 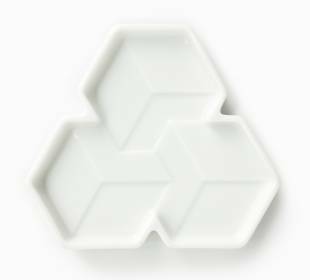 But Shotton takes this one step further: The patterns are also Oscar Reutersvard optical illusions, making these dishes a bit more unexpected. 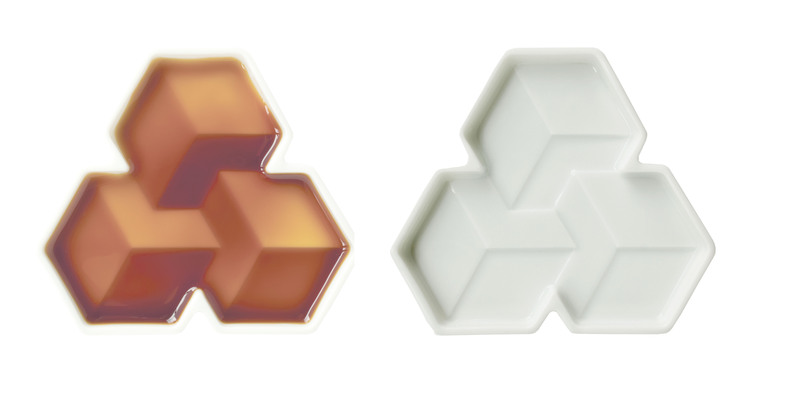 Soy Shapes are made in Gifu and come in sets of two of the same design, priced at ¥3,500 for standard boxes and ¥4,000 for limited-edition hand-signed “slide” boxes. Any combination of the triangle or cube dishes can also be stacked together. After the Great East Japan Earthquake of 2011, designers and volunteers rallied together to establish Ishinomaki Laboratory, a DIY workshop for locals to help repair and rebuild one of the hardest-hit areas of Japan. Since then, the venture has attracted other Japanese and overseas designers to contribute to its own brand of hand-crafted furniture. One of the collaborators, London-based Michael Marriott, is now holding his first solo exhibition in Japan showcasing a full range of interior products that complement the Miyagi Clothes Hanger (pictured), his first piece for Ishinomaki Laboratory. Well known for meticulously crafted functional objects, Marriott’s line is inspired by an unusual combination of engineering and art: Toyota Motor Corp.’s production processes and conceptual artist On Kawara’s factual methodology to creativity. All of the furniture pieces are made from just one 140 x 18 mm plank of plain cedar and a box of screws, and include tables, chairs, benches, shelves, stools (pictured right) — even beds. 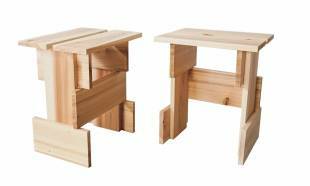 Items (which are limited in number) can be ordered via email from info@designkoishikawa.com and range from ¥8,700 for a set of three hooks to ¥103,000 for book shelves (the stools are ¥19,500 each). 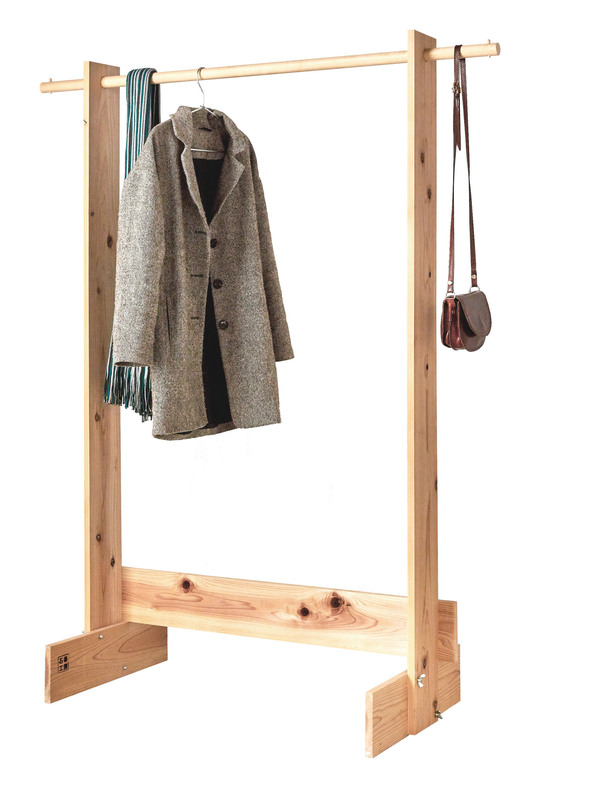 The Miyagi Clothes Hanger is ¥25,920 and can be ordered from bit.ly/ishinomakilab. “On Toyota” is on show at Design Koshikawa in Tokyo until Jan. 15. and is free to visit. Another of the Ishinomaki Laboratory designers is Tomas Alonso. OK, Alonso is actually Spanish, but he studied at the Royal College of Art and is now based in London. Alonso created a wooden and canvas stool for Ishinomaki, and is also one of the creatives who teamed up with potters for the 2016/Arita project, which launched its full series of collaborations last October. Like Marriott, he focuses on functionality, though his Arita series of geometric vessels are deliberately without specific purpose. Instead, the containers, mostly cylindric and semi-cylindric, are designed to be arranged in decorative combinations and for whatever use you like. 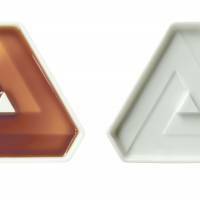 To produce such deceptively simple shapes, the pottery has also used a specially developed strong porcelain that can be fired extra thin to keep the aesthetic sharp. 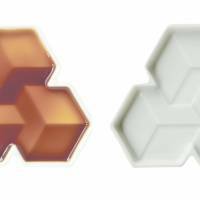 Of different heights and glazed in bold but coordinating colors, Alonso’s containers range from ¥1,188 for a small white semi-circle plate to ¥6,588 for a large black plate and are available from the Seibu Sogo web store. To see find out more about other 2016/Arita brands, visit www.2016arita.com.